Marks/Label: Handwritten on bottom right corner of mat: By Rick Hebb. Handwritten on reverse on frame: May 4/1976 Presented to: The Past Noble Grand Club in F.L.T. From: Sister Martha and Brother Glenwood Hebb. Narrative: The photograph was collected by former Atlantic Rebekah Lodge member and came to the Museum as the result of a call for items from former service clubs in Bridgewater as part of an exhibit called "At Your Service" held in 2016. All identified by donor. The Atlantic Rebekah Lodge, No. 52 was instituted 16 April 1909 in Bridgewater. Members met in the I.O.O.F. LaHave Lodge building in Bridgewater. They also met in the Masonic Temple for a while on Pleasant Street. Later moved to King Street building until this building was destroyed by fire in 1950 where they lost all of their early records. The Rebekah’s hosted their Grand Lodge in Bridgewater in 1923, 1938 and 1948. Eventually the Bridgewater Rebekah’s branch did not have enough members to continue, so they merged with the West Dublin Rebekah’s in 2015. 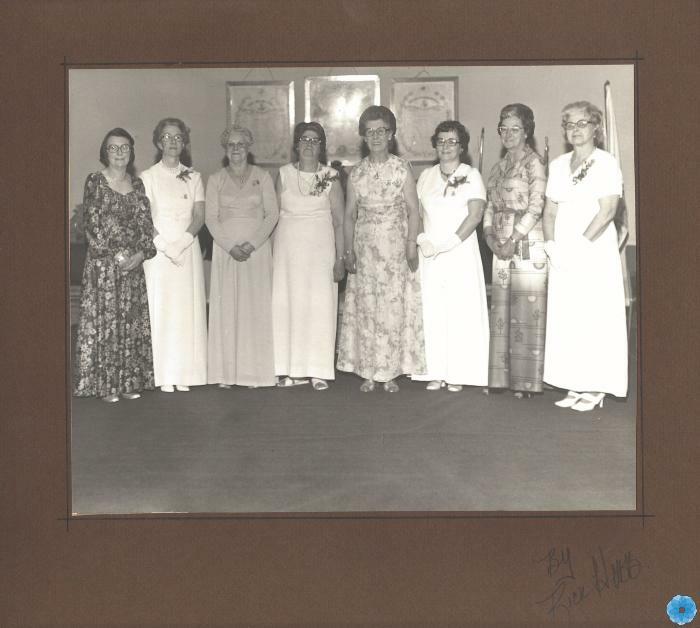 Description: Photograph of a group of eight ladies, all wearing eye glasses and long dresses, with a corsage on their shoulder. Standing in front of three large framed prints hanging on the back wall. All identified as Joan Crouse, Florence Himmelman, Martha Hebb, Greta Woodworth, Phyllis Bolivar, Edythe Bell, Yvonne Crouse, and Phyllis Rhodenizer. Members of the Atlantic Rebekah Lodge, No. 52, Noble Grands, Bridgewater. Hand written on reverse of backing in blue ink. History of Use: Taken to document gathering of service organization members.